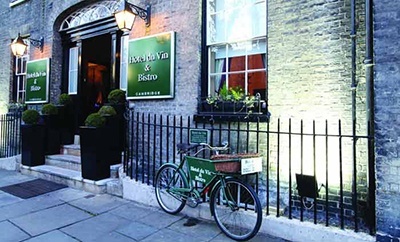 Hotel Du Vin sits amongst the Grade II listed buildings of picturesque Trumpington Street. The hotel was lovingly converted from old University buildings while retaining its original character and quirky architectural features. The HUG will take place in 'Ruinart' room, which is full of character and boasts many original features. Drinks and canapes will be served in the adjacent library, with access onto the courtyard. The hotel does not have a car park, but on-street parking is available on Trumpington Street, which is free of charge after 6.30 pm. The train station is approximately five minutes by taxi. See the map below for directions by car.